Este apartamento ha sido renovado recientemente y tiene todo lo que pueda necesitar. Sofás de cuero, muebles de madera, TV de plasma, presenta muy bien. Pagar la fracción del costo con cerca de hoteles. El apartamento cuenta con ropa de cama, toallas y una cocina totalmente equipada. El apartamento cuenta con los servicios semanales. Todas las habitaciones tienen aire acondicionado llegado. El apartamento también es un paseo muy corto a la Novotel Rockford gimnasio y campo de golf. Cerca del pueblo de Palm Cove y un corto paseo de la playa de Palm Cove. sistema de aire acondicionado split, incluyendo los dos dormitorios. Cocina con nevera, cocina, horno, microondas, tostadora, hervidor de agua y lavavajillas totalmente equipada. El dormitorio principal tiene una cama queen size, y el segundo dormitorio tiene 2 x camas individuales. Palm Cove es una ubicación ideal para todas las cosas en su agenda turística extremo norte de Queensland! A sólo 20 minutos al norte de Cairns ya 25 minutos al sur de Port Douglas. - Disfrute de una comida en uno de los muchos restaurantes. Además, muchas más cosas que hacer y ver! Great place for a relaxing getaway. Apartment is well located in close proximity to beach, shops and restaurants. Apartment was also well equipped with everything the family needed. We had a most enjoyable one-week stay here. The apartment was exactly as described and we had everything we needed. We really appreciated the quietness and aspect overlooking the pool. It's a short walk to the town and beach, but we quite appreciated that separation and the very pleasant walk there and back. The bus service between Palm Beach and Cairns is excellent (and it's a cheap), and a short trip to Coles at Clifton Beach - which is much cheaper than the convenience stores at Palm Cove. Peter very promptly answered our questions before arriving and provided us with all the information needed to make this a hassle free break. Really pleased that you had a great hassle free break. Great location with a lovely view! Red Cowrie at the Coral Coast was a great spot with everything we needed for a lovely few days away. The view over the pool, to mountains and palm trees beyond, was very tropical and got us in the holiday mode. The kids loved the pool and we spent a few days exploring the local area - including an awesome reef trip, Kuranda and the Palm Cove township. There's a great jetty nearby too for any fishermen/women in the family! The host was helpful and prompt with all communication and the property was easy to access. A clean and comfortable stay. The appartment had everything we needed for a home away from home, including sunscreen. Slept well in the bed. The grounds and the pool area are kept immaculately.Thank you to Peter for allowing a late check out, and for being so easy to deal with. We really enjoyed our stay at Red Cowrie Coral Coast. The apartment was really well equipped with everything we needed. We spent many nights on the balcony overlooking the pool, it was a beautiful view. We were glad for the aircon in all rooms as we weren't used to the hot weather! Loved how close it was to the main street of Palm Cove. Comfortable apartment. Happy to recommend. Clean, comfortable apartment in a quite location. Exactly as described. Everything that you need is provided. Comfy bed and pillows. Easy walk to the beach, cafe and shops. 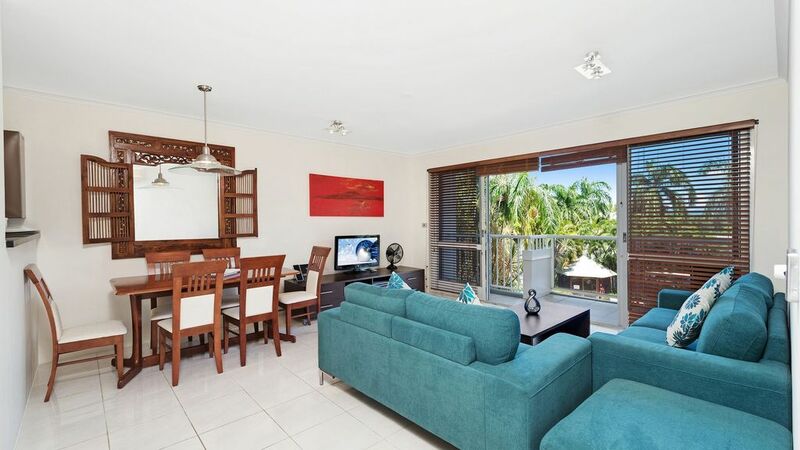 A great base from which to explore beautiful Palm Cove and all the surrounding countryside. Communication with the owner was easy, with quick responses. I will be happy to recommend this apartment to family and friends.